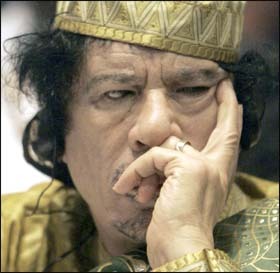 Gaddafi, the Libyan leader and current head of African Union (AU) recently called on Nigeria to split on religious lines, Christians and Muslims, in order to address the endemic clashes that have claimed many lives. This call has engendered mixed reactions from many Africans, Nigerians in particular. While many think it is a welcoming panacea to the Nigerian crisis, others, including myself, think otherwise. A religion-inspired division of Nigeria (a federal government) would never resolve the cause of the recurring clashes; neither would it miraculously heal the symptoms. It looks appealing and easy to suggest division and to presume that it holds the prospect for peace. Divide Nigerian on no grounds other than Islamic and Christian ones and you invite xenophobic attacks, deepen blatant hatred and intolerance and set a bad precedent for Nigeria in particular and Africa as a whole. If Islam and Christianity, which are imported religious belief systems, are formidable forces, potent enough to split Nigeria, anything else, be it political dissent, ethnic differences can equally split any African state or justify further balkanization of Africa. It is important to note that, Nigeria’s oil, which contributes about 90% of its GDP, is mined in the South, where Christians predominate. Enugu, Lagos, Onitsa and other prominent cities in Nigeria with huge public infrastructure, all built from Federal coffers, from both the North and the South, are all located in the South. At infrastructural level alone, one can only imagine how challenging and unrealistic Gaddafi’s solution would prove to be. If you tell a Northern Nigerian man who has established his life and career in the South, along with his family, to leave all of a sudden to a new destination, you are not only unjustifiably robbing him of his rights, but also depriving him of the means to his existence. If that man decides to stay and not leave, it is likely the flame of ethnic and religious hatred would consume him long before he exercised the luxury of thinking twice about his decision. The infamous, bitter and inhumane Korean example of 1948, where mother and child, husband and wife were torn apart from each other, should guide our decisions as Africans in this contemporary era. Gaddafi’s solution to the Nigerian crisis is rooted more in his Islamic ties with the North, and his fundamentalist religious convictions that have little or no space for religious freedom, than a genuine zeal for a lasting solution. If Nigeria splits, no one would be surprised to see him supply money and ammunition to the North against the South in the event of the slightest conflict. These and many other possible outcomes would permanently rob the area of peace and tranquility.